Heat treatment is one of the methods, which is used to enhance some of the properties of wood and wood products. This fact sheet summarizes the basics of typical heat treatment process, along with the results of some of the previous studies carried out in this area. Heat treatment or thermal modification of wood became popular several decades ago. The main idea behind the heat treatment of wood is to improve its overall properties. Thermally modified wood has a great market for exterior use, such as decking and siding with an excellent service life. In a typical heat treatment process, wood is modified in a controlled pyrolysis process, which decomposed the chemistry of wood using a temperature level around 200 degrees Celsius with or without very little oxygen level. Currently, there are several companies in Holland, Finland and France that produce heat-treated wood at commercial scale. Several companies are specialized for heat-treated wood as a raw material, specifically for the sauna market. Thermowood in Finland is one of the most popular ones among these companies. The overall capital requirement for equipment and information on drying schedule for a successful heat-treated wood is still quite expensive, and several established companies in Europe and the USA are major players in the industry. A typical thermal-treatment process of wood has three main steps: drying, heat treatment followed by cooling and conditioning. It is well-known that wood is a hygroscopic material taking and leaving moisture content from the surrounding environment. Such behavior makes wood dimensionally unstable, resulting in significant problems during its service life. The hydroxyl groups located in the cellwall of wood are responsible for its dimensional unstability causing shrinkage and swelling, which can be considered as one of the most important disadvantages of wood-based materials. The process of heat treatment is combined by breakage of the lignin-polysaccharide complex by organic acids released from hemicellulose, which is one of three main elements in the cellwall in addition to cellulose and lignin. Heat-treated wood can have reduced shrinkage and swelling values ranging from 50 to 70 percent. Enhancement of biological resistance against insect deterioration, specifically to termites and certain microorganisms, is also another advantage of heat treatment. Reduction in strength and hardness reduction of heat-treated wood is probably the most important adverse results of such process. Treated wood becomes more brittle, and the mechanical properties, including tension and bending strength of the member, could be reduced by 10 to 30 percent. Therefore, heat-treated wood is not recommended to be used where load bearing is required. Strength reduction of wood due to heat exposure is directly related to the progressive degradation of the hemicellulose between microfibers in the cellwall. In one of the previous studies, Eastern redcedar samples were heat treated at the temperature levels of 120, 160 and 190 degrees Celsius for 6 hours and their shear strength were evaluated. In this work heat-treated samples with the dimension of 2.0 by 1.5 by 0.5 in3 were glued to each other using polyvinyl acetate adhesive and their shear strength were tested on a Universal Testing System. Samples exposed to a temperature of 190 degrees Celsius had 64.1 percent shear strength reduction as compared to those of control samples, while 44.4 percent reduction was found for those exposed to a temperature of 160 degrees Celsius. Hardness values of the same samples also were found 50 percent less as a function of 190 degrees Celsius heat exposure than those of control samples. Some of the studies revealed if the wood is compressed with the combination of the heat treatment, adverse influence of temperature can be reduced to a certain extent, even completely eliminated. Scotch pine and Douglas fir specimens exposed to temperature levels of 190 egrees Celsius and 200 egrees Celsius and compressed in a press using 6 MPa pressure had enhanced compression strength values of the samples ranging from 4 to 17 percent. Another important parameter in a typical heat treatment process is a modification of the color of the sample. Usually, heat-treated wood becomes darker in color, and this is more prominent in the case of light-color species, such as pine. Darkening of wood gives the manufacturers an opportunity to imitate more expensive tropical species by changing the color of less expensive light color species. 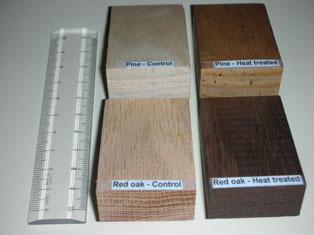 Figure 1 illustrates discoloration of several natural and heat-treated wood samples. Figure 1. Discoloration of heat-treated samples.